Dr. Lawrence Feingold is Associate Professor of Theology and Philosophy at Kenrick-Glennon Seminary in St. Louis. He is the author of numerous scholarly books, including The Eucharist: Mystery of Presence, Sacrifice, and Communion, a comprehensive commentary on the mystery of the Eucharist drawing from Scripture, the Church Fathers, and magisterial teaching throughout the ages. In contemporary society, most people have no awareness that the offering of sacrifice to God is a central act of the virtue of religion and thus a good and morally obligatory thing. Even Catholics who attend Mass are generally unaware that they are participating in an infinite offering to God or that that is the principal reason why there is a Sunday Mass obligation. The more society becomes secularized, the more the notion of sacrifice and its obligation becomes foreign and difficult to grasp. Clearly there is a great need for catechesis about the meaning, glory, and obligation of offering sacrifice to God. Sacrifice implies the person of a priest who offers the sacrifice. Sacrifice and priesthood are inseparably linked. The central idea of the priesthood is that the priest serves as a mediator between God and man. This mediation works in both an ascending and descending direction. The priest’s ascending mediation involves his offering to God of gifts on behalf of the people and sacrifices for their sins, as well as offering the adoration, thanksgiving, and petitions of the entire people. The central act of this ascending mediation is the priestly offering of sacrifice. The Letter to the Hebrews (5:1) defines the mediation of the priest in this way: “For every high priest chosen from among men is appointed to act on behalf of men in relation to God, to offer gifts and sacrifices for sins.” The priesthood is thus essentially linked with sacrifice. The sacrifice of Calvary therefore has an infinite value of reparation, for it gives infinitely more glory to God than all human sin put together gives offense. This sacrifice of Calvary was the true sacrifice prefigured in all the other sacrifices in the history of the world, the one sacrifice that is efficacious in itself. Therefore, it is reasonable to think that after Calvary no more exterior sacrifices would be necessary, for the sacrifice of Calvary fulfilled all the purposes of sacrifice, including propitiation for sin. And this is true. No more animal sacrifices are necessary, for they simply prefigured the sacrifice of Calvary. For this reason, the sacrifices of the Mosaic Law lost their principal reason for being, which was to prefigure the sacrifice of Calvary and the Mass. This was symbolically manifested by the rending of the veil of the Temple on Good Friday as our Lord expired on the Cross. It is not unreasonable to think that it was also symbolized in the destruction of the Temple some forty years later and the consequent cessation of the Jewish sacrificial rites. It is fitting, however, that the New Covenant not be without a sacrifice. But how can this be if the sacrifice of Calvary puts an end to sacrifice? The divine answer is that the New Covenant should have a sacrifice that is the same as Calvary, one by which the Church offers herself in offering her Lord. Christ did not want His Church to be merely the beneficiary of His sacrifice, but also a co-offerer. He wanted her to be able to enter into the glorification of His Father accomplished by His sacrifice, for, as we have seen, the offering of sacrifice to God is both a duty and an inner need of man, a law written on our hearts. It was not enough for Christ to sacrifice Himself for His Bride. He wanted his Bride to be able to offer to the Father, together with Him, the perfect sacrifice. And since His Bride was to remain on earth until His Second Coming, He wanted her to be able to offer the perfect sacrifice in every place until His return. So, on the night before He died, Jesus wished to leave a perfect sacrifice to His Church. But what sacrifice could He give to His Church to offer to God, since He Himself in person was about to offer. everything to the Father on the Cross? He could not give His Church a figure or prophecy of His own sacrifice, as God did to ancient Israel, for the figures were fulfilled on Calvary. Nor could He give the Church, His Bride, merely a symbol or remembrance of His great sacrifice, for that would be too little. The solution was worthy of both the divine wisdom and the divine omnipotence. Christ willed to leave to his Church the same sacrifice that He offered His Father on Good Friday. By instituting the miracle of transubstantiation, Christ made Himself present in the Eucharist as the divine Victim, the same Victim who was offered in a bloody manner on Calvary. Furthermore, by instituting the priesthood at the same moment, He arranged to be continually present as High Priest offering His own Body and Blood in the sacrifice of the Mass through the ministerial priests ordained to act in persona Christi throughout the ages until His second coming. Nothing less than the Sacred Heart of Jesus Himself, burning with love for man, is present, mystically immolated together with His entire humanity and offered in this holy and immaculate sacrifice. He is offered, however, not in the cruel and bloody manner of Calvary, in which His Blood was physically separated from His Body, but in an unbloody and sacramental fashion worthy of the Heart of God, in which His Blood is sacramentally separated from His Body, for, having risen from the dead, His Body and Blood can be physically separated no more. A second difference is that, on Calvary, Christ alone offered Himself. In the Mass, He allows Himself to be offered by His whole Mystical Body through His ordained ministers. The Eucharist: Mystery of Presence, Sacrifice, and Communion explores the three ends of the Sacrament of Sacraments: God’s true presence, His redemptive sacrifice, and spiritual nourishment through communion with Him. 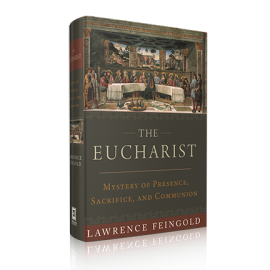 In this follow-up to his groundbreaking work, Faith Comes From What Is Heard, Lawrence Feingold constructs a biblical vision of the Eucharist from its prefigurement in the Old Testament to its fulfillment in the New and presents the Eucharistic theology of the Church Fathers, St. Thomas Aquinas, and magisterial teaching from centuries past through today. The Eucharist is a masterful text, both challenging and spiritually rich, that comprehensively examines the unspeakable mystery that is the Eucharist.